I have finished the sofa table, it is painted in a beach cottage furniture style with an off-white crackled finish. The sandpiper birds are running along the beach just like you see them when you are at the beach. My painting is a vignette so the crackled finish shows through the painting at the edges. Create your own beach cottage feel with these unique designs that are sure to bring the beach home to you. My next project will be a corner table with the same off-white crackled finish. I will be posting each stage of the project right here on this blog so check back. Is this table for sale? If so, how much? Hi Cheryle, This handpainted table is $500.00 and is a sofa table. 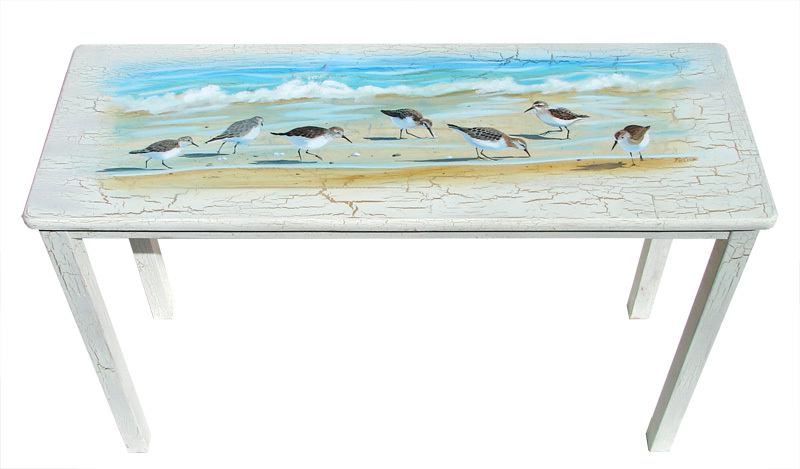 Any size table can be painted with the sandpiper birds. The table in the picture is sold and I custom paint the tables one at a time. Let me know if you would like to order one.